Is political correctness harming our students? It is well known that our high school students do poorly when compared to their peers in other countries – 25th in math, 17th in science and 14th in reading. U.S. Secretary of Education Arne Duncan cites a McKinsey study that said that the U.S. ranked 22nd of 27 OECD countries when they calculated the average salaries of teachers with 15 years experience compared to the average earnings of full-time workers with college degrees and, consequently, proposed raising teacher’s salaries. He did not cite the fact that the U.S. spends on average $10,995 per student, $2,826 more than the average OECD country. The difference is the bureaucracy of administration. Schools face many problems, not the least of which is the egregious amounts of money spent on administrators and non-teaching staff. A report last year from the Friedman Foundation for Educational Choice studied public high schools, their enrollments and staffs, over the fifty-nine years from 1950 to 2009. They found that, while student enrollment doubled and the number of teachers grew 252%, the number of administrators and other non-teaching staff grew by 702%! In another instance, Maine saw a decline of 11% in students between 1992 and 2009, yet saw the numbers of teachers increase by 3% and non-teachers by 76%. Following the implementation of No Child Left Behind in 2002, teachers and non-teachers were hired at the same rate, but still double that of students. Perhaps the best exposé I have seen on this subject is Mind the Gap by Dr. Richard J. Soghoian. Dr, Soghoian is the headmaster of Columbia Grammar School, a private day school in New York, but his observations on this matter are relevant to public schools and colleges, as well as private schools. There is something wrong, and it isn’t a lack of money. Political correctness plays a role. School choice has always been the right of the wealthy, but is generally unavailable to the poor and middle class. The concept of co-locating charter schools in traditional public school space is a choice that Leftists don’t want to offer the poor, as the New York Post noted in an editorial on Leonie Haimson, a New York public school parent-activist who does what most public school parents cannot – she sends her children to private school. Another example. Friday, April 19 will mark the 13th annual Day of Silence, a student-led event that brings attention to anti-LGBT (lesbian, gay, bi-sexual and trans-gender) name calling. I agree with the notion that bullying and harassment are issues that need to be addressed. But I know of no school that has focused to the same degree on the bullying of fat kids and/or those that are poor, or who suffer some physical handicap. The Day of Silence has become an excuse for teachers and administrators to promote homosexuality, bi-sexism and trans-genderism. While I suspect that such time spent by teachers may help students in their applications to coastally-elite universities, it will do little for them in a globally competitive world. A Day of Dialogue, sponsored by an evangelical Christian organization, Focus, has not received the same support. Its purpose is to engage “in honest and respectful conversation among students about God’s design for sexuality.” But it is not politically correct. Personally, given the opportunity, I would sit out both days, but one is optional and the other is not. Defenders of what we term political correctness claim that what they are doing is embracing a richer, more dynamic and complex vision of Western culture and its relations to other societies. Twenty years ago, in a defense of political correctness, Professor Marilyn Edelstein of Santa Clara University wrote: “But no one I know wants to inhibit genuine free speech or an open exchange of ideas.” Unfortunately, that is what has happened. So-called liberal universities have become blind to ideas that do not conform to their pre-conceived opinions. They have, in fact, become illiberal. David Burton, author of The History of Mathematics, noted last year that fifty words have been banned by the New York City Department of Education from use on tests. Included are such words as: wealth, poverty, Halloween, terrorists, slavery, divorce and, mind-numbingly, birthdays and dinosaurs. For each there is a politically correct explanation, such as the word might evoke “unpleasant emotions in students,” or, in the case of dinosaurs because “they might offend people who do not believe in evolution.” All of my ten grandchildren have more wisdom than the idiots who proposed such rules. How can children learn when such restrictions are deployed? Minds are designed to be expanded, not restrained. An extreme example as to how far left university professors have descended was the recent comment by Tulane professor and MSNBC host, Melissa Harris-Perry. She let slip that the raising of children should be the responsibility of the community, not just the parents. Not surprisingly, Rush Limbaugh picked up on her comment, as only Rush can do. In response, in my opinion, she simply dug the hole, into which she had fallen, deeper. She declared that she was not saying families should be replaced. She claimed she said: “Once it’s [raising children] everybody’s responsibility and not just the households then we start making better investments.” The words are reminiscent of Mao Tse Tung’s, and not too different from a former first lady who once said it takes a village to raise a family. My wife, for one, would heartily, and respectively, disagree. Jennifer Schuessler, writing in Saturday’s New York Times, noted that a new specter is haunting university history departments: “the specter of capitalism.” “After decades of ‘history from below,’ focusing on women, minorities and other marginalized people seizing their destiny,” she writes, “a new generation of scholars is increasingly turning to what, strangely, risked becoming the most marginalized group of all: the bosses, bankers and brokers who run the economy.” Who will be marginalized, in my opinion, are the suckers who sign up for such classes. The economy is far more complex than banks and brokers. The focus on so narrow a field is fine for graduate students, but does not serve the needs of those who need a comprehensive study of American history. Amazingly, as David Feith wrote in the weekend addition of the Wall Street Journal, Bowdoin College, one of the nation’s finest colleges, has no requirement for history majors to take a single course in American history. Last Tuesday, Thomas Friedman’s column in the New York Times was titled, “My Little (Global) School.” He puts a positive spin on the subject of underperforming schools, by noting that there are schools that compete effectively against the best in the world. That seems to me a statement of the obvious. 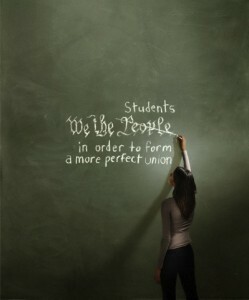 There are about 27,000 public high schools in the U.S. Statistically, a few of them will be superior. But he does note that the best schools have some things in common: strong fundamentals, strong cultures that believe anything is possible with any student. They emphasize “soft skills,” like “completing work on time, resilience, perseverance – and punctuality.” Those are all characteristics that would have been known to students and teachers 100 and 200 years ago – they do not represent multiculturalism; they reflect common sense. They are an acknowledgement that real values are absolute and eternal, not relative. They suggest a return to basics, and they acquiesce to the notion that our commonalities as Americans are critical and, frankly, should be emphasized over our differences. Universities, the media and politicians have sliced and diced Americans every which way; so that we all have some reason to feel life has cheated us. We are African-Americans, Hispanic- Americans, Latinos, Mexicans, Jews, Asian-Americans, rich, poor, gay, straight, conservatives, liberals, cultured and rednecks. We all belong in – at least one box, providing us some comfort and some grievance. It encourages people to seek help from a caring government. However, with a people so divided, it is impossible not to offend some, even if it is only those who are politically incorrect. Ultimately all of this politically correct foolishness will collapse of its own weight. To a large extent, we all reflect the age in which we grew up. My era was the 1950s. Most of today’s senior professors and university decision makers came to maturity during the Vietnam era. Another, younger group – my children’s age – grew up during the 1980s – the Reagan years. Our behavior is influenced, to an extant, by the times in which we grew to maturity. Fads change, either for good or bad. Unfortunately this last one has lasted a long time and has severely and negatively impacted at least two generations of our youth, but eventually it will collapse as the professors who support such ideas and the universities that support them are found to be as ephemeral as they appear to people like me. The way in which we educate people is changing. Already, the move toward on-line education is making noticeable waves. Online classes more closely link studies with jobs. But some things are forever. One hundred years from now, people will still be reading Shakespeare, the Bible and Dickens. Will one be able to say the same about The Feminine Mystique? I very much doubt it.